The recent Shangri-la meeting in Singapore saw some sharp exchanges between Chinese and other participants. Beijing’s deployment of an oil rig protected by more than 80 naval vessels in the South China Sea four days after President Barack Obama’s “reassurance trip” to China’s East Asian neighbors in April 2014 was widely seen as a deliberate and calculated provocation. The key reason for China’s aggressive posturing on the seas is the tectonic shift in Beijing’s strategic environment that occurred following the collapse of the Soviet Union in 1991. For the first time in its long history, China no longer faces any threat whatsoever on its northern frontiers and this immense geopolitical development largely explains Chinese military’s expansionist moves on its eastern seaboard and southwestern frontiers. It is worth recalling that the successive Chinese dynasties built the Great Wall to keep out the troublesome northern Mongol and Manchu tribes that repeatedly overran Han China. In 1433, faced with increasingly bold raids made by Mongols and a growing threat from other Central Asian peoples to its land borders in the northwest, China’s Ming rulers halted Admiral Zheng He’s expensive ocean voyages so as to concentrate their resources on securing the Middle Kingdom’s land borders. From the 18th to 20th centuries, threats first from the ever-expanding Czarist Russia and then the Soviet Union kept the focus of Chinese military planners on their northern frontiers. Except for a very brief period of bonhomie in the 1950s, Beijing was preoccupied throughout the Cold War with the threat from the north until the Soviet collapse in 1991. Despite Moscow’s geopolitical concerns about Chinese encroachments in Russia’s Far East and the loss of Central Asia to China’s growing influence, President Vladimir Putin – faced with isolation by Europe and the United States following Russia’s annexation of Crimea and continuing unrest in eastern Ukraine – has accepted unpalatable terms from China to clinch a massive gas pipeline deal that will diversify Russian energy export markets away from Europe, and make China Russia’s major ally. On a whole range of issues, Russia, along with China, is challenging the postwar international order. Even though China has backed Russia neither on Georgia nor on Crimea, Putin believes the ties between Moscow and Beijing are at their “peak.” If a “Sino-Russian alliance” is being resurrected, then in a complete reversal of roles from the early Cold War era, China – not an economically and demographically shrinking Russia – is the stronger partner in this alliance. As in the past, entanglements in the West have once again led Russia to make concessions in the East. Beijing’s game plan is to make Russia economically dependent on China just as the West has become addicted to the cheap Chinese manufactured goods. India will need to re-calibrate ties with a Russia that plays a second fiddle to China and joins Beijing in arming Pakistan. Not surprisingly, media is awash with reports of a “new Sino-Russian strategic alliance threatening to dominate [the Eurasia] heartland,” thereby signaling a “nightmare of Mackinderesque proportions for Washington.” Some envision a Beijing-Moscow-Teheran axis based on energy, trade and security across the Eurasia. Though Russia’s pivot to Asia is motivated by turbulence on the western front and comes from a position of relative weakness, Washington is nonetheless being increasingly challenged by states seeking to revise regional balances of power. influenced by public perceptions of strategic imbalance and rapidly changing geopolitical equations. The struggle for dominance over “contested commons” (maritime, cyber and outer space) is intensifying. Strategic concerns loom large as China’s growing ambition, power and reach run up against the interests of old, established powers. The Diplomat’s Zackary Keck and Chen Dingding have started a debate on whether China will be a different kind of a global hegemon or behave just like the United States and other hegemonic powers in the past. Chinese leaders, of course, leave no opportunity to eschew any hegemonic aspirations or superpower behavior. Yet, official claims to the contrary notwithstanding, China is behaving just as other rising powers have behaved in history: it is laying down new markers, drawing new lines in the land, air, water, sand and snow all around its periphery, seeking to expand its territorial and maritime frontiers, forming and reforming institutions, and coercing others to fall in line. Map-making seems to be a growth industry in China. Beijing’s international behavior (i.e., its “exercise of power”) is not and won’t be different from other great powers’. The Asia-Pacific region is thus on the threshold of change – the known and unknown; challenges and uncertainties abound. I argue that seven major strategic shifts will determine China’s strategic behavior and Asia’s geopolitical landscape in the years and decades to come. Power in the international system is relative and ever-shifting. Over the past three decades, China has demonstrated tremendous ability to plan and mobilize national resources to implement goal-oriented, timely action strategies in economic, diplomatic, and military arenas. The global impact of China’s success will be “Chigantic” (amend the Oxford Dictionary). If China can sustain its growth, China’s gross domestic product (GDP), military, and R&D spending could rival those of the United States, albeit not in terms of quality but quantity. China has the potential to emerge as a peer competitor far more powerful than the Soviet Union. No rising power is ever a status quo power. Power is, by nature, expansionist. It is actually intoxicating. In 2009, the bestseller in China was a book called Unhappy China. When the world is their oyster, why would China be so unhappy, one might ask. Historically, rising powers are highly suspicious, paranoid powers: they think others are out to get them, and stop their march to glory. Expecting too much too soon, they overreact. That sometimes leads to their unraveling. Think Japan and Germany. Rising powers also tend to be risk-takers and impatient powers. They flex their muscles and test the resolve of old, established powers. They seek to benefit from the weakness in resolve – not capabilities – of the established powers by employing asymmetric strategies to chip away at their hegemony. Post-2008 financial crisis, China has transitioned from “hide and bide” policy to “seizing opportunities, taking lead and showing off capabilities to shape others’ choices in China’s favor.” The postwar international order has depended on three factors: U.S. alliances, uncontested American maritime dominance, and a stable, unmolested balance of power. All these are now being challenged by China’s growing power and purpose. For, China – the biggest beneficiary of the postwar order – no longer sees U.S. primacy as serving its interests. One Chinese military officer observed: “American forward presence and alliances constrain China’s future growth and goals in the region.” Beijing dubs U.S. alliances “relics of the Cold War” which must be dismantled to restore what it calls “natural power balance in the region” (translation: a Sino-centric hierarchical order of pre-modern Asia). It is not in China’s DNA to play second fiddle to any other power. Moscow learned this the hard way in the 1950s. Now it’s the turn of those Americans who have long dreamt of co-opting China as a junior partner. Many would argue that regimes that do not share power or abide by the rule of law in domestic politics do not abide by the rule of law in international politics or share power in world politics. China’s Asia strategy is to undermine the United States’ credibility as regional security guarantor. Beijing’s diplomatic rhetoric notwithstanding, the “New Type of Great Power Relations” seeks U.S. recognition of China’s primacy in Asia in a geopolitical deal that limits Washington’s regional role and presence, and relegates traditional U.S. allies (especially Japan) to the sidelines. This push and shove will continue for decades because the Chinese see the U.S. as “in irreversible decline, and growing weaker as China grows stronger.” From Beijing’s perspective, the main issue is how to manage, and profit from, America’s decline. The challenge, from Washington’s perspective, is how to manage China’s rise within the U.S.-led order without diluting American role and presence. Who emerges at the top in this poker game will ultimately determine the future of world order. It is against this backdrop that the Obama administration officials have been visiting Asian capitals to reassure U.S. friends and allies about security commitments, and reaffirm Washington’s determination to rebalancing to Asia. Significantly, China is not rising in a vacuum. Under Shinzo Abe’s leadership, Japan is becoming a “normal nation” with the lifting of restrictions on collective self-defense and arms transfers. India has been economically and strategically rebalancing toward the Asia-Pacific for nearly two decades under its “Look East” policy. With the victory of Narendra Modi-led BJP government in May 2014 elections, India may well be back in the reckoning. Since Beijing will not abandon its policy of engaging India economically while strangulating it geopolitically, a revitalized India will form the southern anchor of an Asian balance of power and frustrate Chinese efforts to establish supremacy. Small and middle powers (Singapore, South Korea, Indonesia, Vietnam, the Philippines, and Australia) are also maneuvering for balance and advantage. Indonesia and Vietnam, in particular, are upgrading their naval power, as territorial disputes in the South China Sea escalate. For its part, Russia is using its vast energy resources to stage a comeback on the world stage. Though it pre-dates the Ukraine crisis, the Russian pivot to Asia is set to deepen given Western isolation under sanctions, Gazprom’s 30-year gas deal worth $400 billion with China, and growing demand for Russian weaponry and energy by China’s neighbors. Russia is unlikely to slide into the role of “China’s Canada” without resistance. It is indeed a very complex and crowded geopolitical space out there. These Asia-Pacific powers are today where Germany, France, Britain, and Italy were at the beginning of the 20th century. They are looking outward globally in search of markets, resources and bases, jockeying for power and influence, outmaneuvering and outbidding each other in different parts of the world, and forming natural resources-based partnerships characterized by hedging strategies. The major power competition is between China and the United States, but in the maritime and continental domains, it is between China and Japan and between China and India. 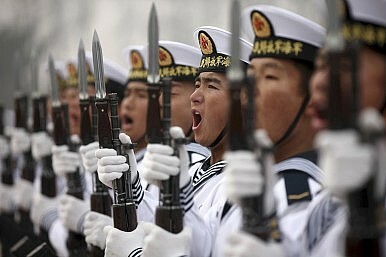 Indian and Chinese navies are showing the flag in the Pacific and Indian oceans with greater frequency. The logic of geopolitics – that is, Japan’s and India’s worries about their place in a Sino-centric Asia – will forge a closer bond under the Abe-Modi leadership. It will intensify Beijing’s strategic competition with both Tokyo and New Delhi. Much like Europe in the late 19th and early 20th centuries, the Asia-Pacific of the early 21st century is thus home to several rising, contending powers and some fragile or failing states. As new powers rise in Asia, new strategic balances are emerging as partnerships and alliances among states shift. Simply put, the Asia-Pacific of the early 21st century bears more resemblance to Europe of the late 19th and early 20th centuries, not Europe of the old, retiring powers of the 21st century. Russia’s moves against Ukraine may have unnerved European powers but there is no sign of a major strategic pushback by European countries against Moscow. That is certainly not the case in Asia. For the first time in modern history, Asians are now spending more on defense than Europeans. The rise of nationalist leaders in Japan, the Philippines and India is in part because of their predecessors’ perceived failure to deal strongly with Chinese transgressions. This is the decade of power transitions in Asia. For small and weak states in China’s neighborhood, this is the decade of living dangerously. Among regional countries, China arouses unease because of its size, history, proximity, power, and, more importantly, because memories of “the Middle Kingdom syndrome” or tributary state system have not dimmed. Historically, there has never been a time when China has coexisted on equal terms with another power of similar or lesser stature. As in the past, a rich and powerful China demands obeisance and deference from other countries. What has changed is that Beijing’s economic interests have now displaced the ideological fervor of the past. In Asian capitals, there are hardly any takers of “China’s peaceful rise” (ask Mongolia, Japan, Vietnam, the Philippines or India) or of “non-interference in internal affairs” rhetoric (ask North Korea, Cambodia, Laos, Malaysia, Indonesia, Myanmar, Nepal or Sri Lanka). The growing economic ties between China and its Asian neighbors have created a sense of dependency and despondency. While China’s neighbors do not oppose China’s power and prosperity, they do not welcome their own loss of strategic autonomy in foreign policymaking. With the exception of a few (notably Pakistan), most Asian countries (including North Korea) show little or no desire to live in a China-led or China-dominated Asia. Instead, they seek to preserve existing security alliances and pursue sophisticated diplomatic and hedging strategies designed to give them more freedom of action. Given China’s centrality in Asian geopolitics, “hedging,” or old-fashioned “balancing” vis-à-vis China is becoming the most preferred option, without giving up on the many benefits of engaging Beijing. To this end, each major power is rebalancing its posture and strategy. The U.S. “rebalance,” India’s “Look East,” ASEAN’s “Look West,” Australia’s “Look North” policies, and Japan’s defense cooperation with Australia, the Philippines, Vietnam and India are signs of the times. The argument for balancing against China rests on some questionable assumptions.